The present brick St James' was built in 1981 and is the church's third rebuilding. It stands, as it always has done, in a densely built part of Aston. The church website can be found at http://www.astonnechellscofe.org.uk/history_stjames/ . 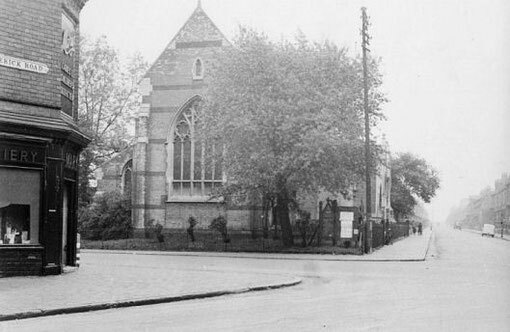 The second St James' Church - probably in the 1950s. This image and that at the top of the page are from the Birmingham History Forum courtesy of Gillian Atkins. St James' Church in Frederick Road originated as a mission of Ss Peter & Paul's, Aston parish church, in 1891. A new church was built in 1906 of white brick with stone and red brick dressings in the Gothic style. It had a chancel, nave with aisles and a vestry. Consecrated the same year, a parish was assigned to it out of that of Ss Peter & Paul. 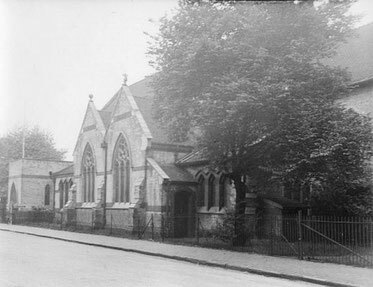 St James' also had a mission room in Tower Road licensed for public worship from 1908 to 1937. In 1981 a multi-purpose building replaced the earlier gothic church of 1906. The main hall has a Sanctuary that may be screened off, allowing the nave area to be used for community use. The building also includes purpose-built accommodation for the St James Community Support and Advice Centre. The church was badly damaged by fire in 2001 necessitating major repairs. Image below from Google Maps. Acknowledgement - See British History Online - Victoria County History of Warwick Volume 7 The City of Birmingham ed. W B Stevens 1964 - http://www.british-history.ac.uk/report.aspx?compid=22976. There is further information on the church in a thread on the Birmingham History Forum website - http://birminghamhistory.co.uk/forum/showthread.php?t=34309.